A side-by-side comparison of the presidential nominees from the four largest political paties, detailing their issue stances on all of the key issues of the presidential race. Based on information from the website OnTheIssues.org. 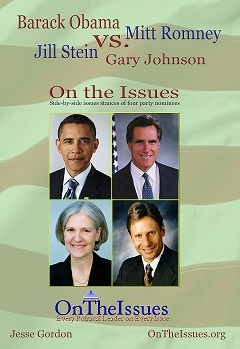 Gary Johnson: Side-by-side issue comparison to Mitt Romney. Jill Stein: Side-by-side issue comparison to Barack Obama. Mitt Romney: OpEd: Majority are fiscal conservatives and social liberals. Barack Obama: Green Party OpEd: We are not out of Iraq. VoteMatch is our 20-question quiz which summarizes the candidate's views on the controversial issues of the day. Gary Johnson (Libertarian 2012 nominee) in GOP debates: Orlando; S.C.; and Twitter. Gary Johnson interview in Rolling Stone Magazine. Jill Stein interviews: Truthout and OnTheIssues. Other Interviews: Sean Hannity; Club for Growth; OnTheIssues; and AmericansElect.